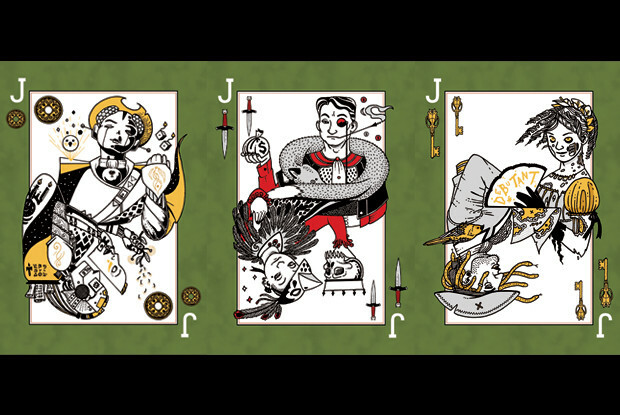 Fans of Australian speculative fiction (broadly encompassing fantasy, SF and horror) may be interested to learn that the Canberra Speculative Fiction Guild has launched an Indiegogo crowdfunding campaign for its next anthology, A Hand of Knaves. What is it? A Hand of Knaves is an anthology of science fiction, fantasy and horror stories featuring characters inhabiting the shadowy corners of speculative fiction. Rogues, thieves, pirates and ne’er-do-wells abound in genre fiction. Sometimes heroic, sometimes villainous, often somewhere in between, rogues are as likely to steal one’s heart as one’s purse, and show little remorse while helping themselves to either. Tales of treachery, rakishness and good old-fashioned skullduggery (with or without the involvement of a secret heart of gold or two). Good stuff. Should be fun. Editors Chris Large and Leife Shallcross are both great writers in their own rights, and they have a good eye for entertaining and smart fiction. One thing to note is that the crowdfunding campaign is not of the all-or-nothing variety. The book’s production is already paid for. This campaign is intended to raise the pay rates of the people involved, to commission more art and to pay for cool extra goodies like hardcover copies and decks of cards. The writers among us might also be interested in the various editing and critiquing opportunities offered under some contributor tiers; from personal experience I can guarantee these will be worth it if you want to level up your fiction. For most patrons though, the crowdfunding campaign acts as a pre-order service. You can get the books ahead of the official launch, delivered right to your door (or your email address, if all you want is the ebook). And for full disclosure, I have submitted a story to the editors for the anthology. However, the blind submission process means that my story is competing with every other author’s on an equal footing. So no guarantees whatsoever that I’ll make the cut. But I still think you should back it, because knaves. This entry was posted in Writing news and tagged a hand of knaves, chris large, csfg, indiegogo, leife shallcross. Bookmark the permalink.